The NoR, Sailing Instructions and Courses documents are constantly being checked for accuracy and may be superseded by the day of the event. Please check back. The last competitive gasp of the cruiser season which can only mean crane-out is just around the corner. Another season nearly over! For those unfamiliar with the Black Isle Challenge Cup it consists of a one off keelboat race around various navigation marks in the Moray Firth. The entries are split into two handicap classes (fast and slow) but they all race around the same general course (however in an effort to keep the fleet closer together the fast boys are sent off on an extra leg) with the race lasting between 2 to 3 hours depending on wind conditions. Whilst the BICC is a Chanonry event it does however form part of the annual MYA (Moray Yacht Axis) racing calendar and therefore we receive entries from our neighbouring clubs of Nairn, Cromarty and Invergordon. Any visiting yacht will be made welcome and anyone who fancies crewing on one of the boats is welcome to contact CSC and we will try and organise a berth for the event. Following the day’s racing a prize giving for both the BICC event and the MYA series will be held in the clubhouse. Hot food and drinks will be available as will a licensed bar. All participants, visitors and spectators are encouraged to hang around for a blether. A water taxi service will be on hand to get crews back out to the moorings. The Sailing Instructions and Entry Form for the event are published above. In 1983 John McNiven, the Cruiser Captain of Chanonry Sailing Club, CSC, proposed that a cruiser passage race be held around the Black Isle! John was a very keen cruiser sailor and wanted to promote handicap passage racing for cruisers amongst the Moray Firth Sailing Clubs. Mike Martin of CSC recalls that a more practical race course was eventually discussed and agreed which was from Fortrose to Invergordon & return using the local navigation marks in the Moray Firth. The March 1983 Newsletter subsequently notes that the course was to be from Fortrose to the Cromarty Firth upstream of Invergordon and back and that it was to be hoped that this cruiser race would become an annual event enjoyed by all the cruising clubs in the area. John McNiven had retired from his boat building days on the Clyde which included designing and building “a Scottish Folkboat” known as the Arden 4 tonner. John had been a key player in the formation of Arden yachts together with George Hulley this association later became Nick Stratton yachts which gave the sailing world the Bolero series of racing yachts. John helped run the Richmond Hotel in Tomintoul together with one of his sailing sons before retiring to North Kessock. At the inaugural race on the 14th May 1983 there were seven fast & five slow handicap boats taking part. The weather conditions were lively with frequent broaches & even a sail blow out occurring over the 28 mile course. The race took almost seven hours to complete with only three retirals. 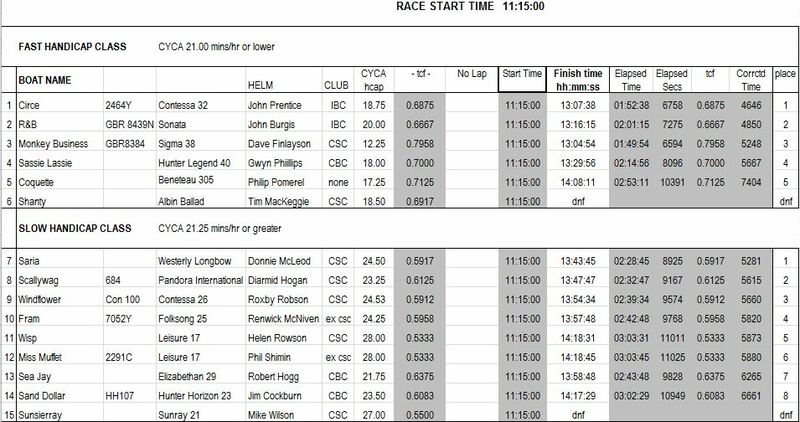 In addition to several press cuttings in the club “Scrapbook” which record the thrills and spills of the day we also have the original race results sheet recording boat names & skippers for this first race. Ronnie Wilson won the fast handicap class in Skedaddler, a Westerly Fulmar & Mike Martin won the slow handicap trophy in Aquila, a Halycon 23. The Fast handicap trophy which is often referred to as the Oarsman’s cup was probably acquired from the Highland Cruising Club. The Slow handicap trophy & the keeper prizes were sponsored by the McNiven family for many years. The Black Isle Challenge race is now a slightly less arduous event which generally lasts about three hours and is held at the end of the Moray Firth cruiser racing season. The race is open to our neighbouring Moray Yacht Axis, these MYA clubs comprising Invergordon, Cromarty, Findhorn, Nairn as well as Chanonry. The race course normally takes in Chanonry point to enable some possible dolphin spotting & photo opportunities for the participants, the spectators and even some supporters. The race is usually followed by a meal in the clubhouse and thanks to a bar licence allows some lively craic regarding the events of the sailing season. The event has latterly become the venue for the annual MYA series prizegiving. MYA club sailors either compete on the water or come by road to join in the end of season craic at the prizegiving social. In 2012 the Black Isle Challenge event was included as one of the MYA series races for the first time and so it has potentially become the final cliff hanger event in deciding the overall MYA winners.